There are many options that you can choose when you want to start breeding tarantulas, and one of the most popular ones is the Pelinobius muticus, commonly known as the King Baboon Tarantula. While this is a very famous tarantula, they have a lot of personality and will be in a defensive state almost all the time. The King Baboon Tarantula has a big size, having a maximum leg span of 20 cm. They come from East Africa and are commonly found on Kenya and Tanzania, while there have been some specimens known to be found in some regions of Uganda. They like to spend their day underground, so you won’t be able to see them during most hours of the day. They are the only members of the Pelinobius genus, so they are a fascinating and unique species to have at home. As already mentioned, this is a very defensive tarantula. Even though they don’t have urticating hairs, they can defend themselves pretty well. Due to their big size and a strong bite, they can kill several types of animals, including some species of rodents and even snakes! These fellas know how to take care of themselves in the wild. Despite being a very popular tarantula, it isn’t suited for a beginner. These tarantulas have long longevity, so if you take care of them properly, you can expect them to be around for a long, long time. Like it’s usual in tarantula species, the females can live longer than the males, with specimens known to have lived up to 25 years; the average lifespan of a female Pelinobius Muticus is of about 20 years. The males have a longer lifespan than most of the rest of tarantula species; they are known to live from 10 to 15 years; very impressive! Regarding their physical characteristics, as said above, they can reach a leg span of up to 20 cm, but there are some specimens known to have developed a bigger size, reaching a leg span of 22 cm. You can’t expect them to have a wide variety of colors; their coloration only has shades of brown and some orange details. Despite that, they are really unmistakable. Like mentioned above, they’re a defensive species and will attack almost anything that approaches them when feeling in danger. Their venom is very potent, even as spiderlings they can give you a very unpleasant sensation that can last a few days. Besides that, you can expect them to be underground during most hours of the day (as mentioned above) since in the wild they are usually in this state. They’re very active during the night time. They can be very fast when they need to. We have already mentioned that, even though their venom isn’t a real danger to humans, they can give a very unpleasant sensation that can last for a while. Add the fact that most of the time they’re expecting something dangerous in their environment and are ready to attack, so handling them is definitely not a good idea, not even for an expert. It’s better to keep them unbothered and minding their own business. You don’t want something bad happening to you! Their feeding isn’t that complicated, but as they are very defensive, you must use a helping tool when taking care of their terrarium or trying to feed them. They will accept many species of insects, including crickets, cockroaches, beetles and more. You can feed them with mice as well, but make sure you do not feed them with things bigger than half of their size. We’re talking about keeping a really big sized tarantula, so you must provide a terrarium big enough for them. Perfect size for one may be of 30x40x40 cm, but if you think that’s too big, then you should ask about something that suits your tarantula better. Since they like to dig and spend most of the sunlight hours underground, you should provide at least 20 cm of a substrate for them to feel comfortable and at home during most hours of the day. During the day, they will hide somewhere they already dug, so you can’t expect them to be around during that time; however, you must take care of the temperature of their terrarium properly. The optimal temperature for the King Baboon Tarantula is between 24-28°C. You should adjust the levels throughout the day; lower it when it’s already night, you can do it up to 18°C and you won’t notice a change in their behavior; make it a bit higher during the day. The key is to try to keep a good balance between the temperatures during the days, so your tarantula doesn’t get environment-stressed. The humidity of the terrarium should not be too high; with levels that can vary from 40-50%, you can perfectly mimic their natural habitat. Inside their hideout, the humidity should be of around 75-80%. As usual as with many tarantula species, the females are known to outgrow the males throughout their life. A mature male is very weak, and their partner usually eats them once the copulation is done, no matter the circumstances. The female is ready for the mating after 4 or 5 weeks the molting has happened. The males are usually sexually mature after molting about 11 times, and five years. The copulation process is a bit complicated due to the risk of cannibalism mentioned above, which happens most of the time. You should be careful when you first introduce the male to their new partner. If the results are good, the female will be hiding more than usual; you can expect an egg sac to be developed within the next three months after the copulation; they will take care of it during the next four months. After the spiderlings are born, the best idea is to separate them from each other to prevent cannibalism from happening. This is a tough tarantula species to have, and although they are very popular among the breeders, this can be a very hard task, even for an expert. A novice in the tarantula-breeding world shouldn’t think of having this species; there are easier ones to take care of. Not only they are aggressive, but they will also find any weak spot around the terrarium to escape from it; you should be careful and make sure that there isn’t a single spot where they can get away. You wouldn’t want these big friends to be walking around your house freely! 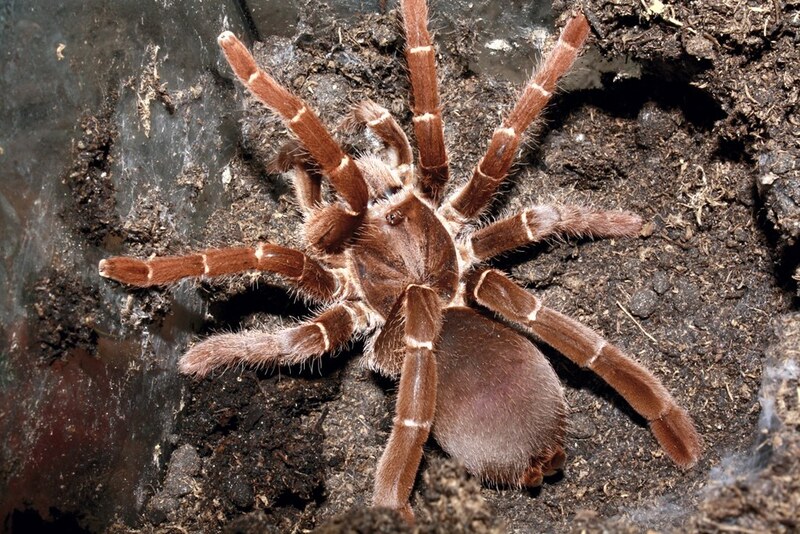 As mentioned multiple times, if you want to see the tarantula walking around, this species is not for you, as they are most of the time in the hideout they dug somewhere in the terrarium. In conclusion, you should only consider the King Baboon Tarantula as an option if you are an expert breeder and think that you are capable of handling such a moody and hardy species, but even if you’re an expert, you should be careful with this species as they are in a defensive state most of the time.